Different venue. Different race. Same result. Just as they did in last September's Animal Upper Gauley Race near Summersville, Andrew McEwan, Geoff Calhoun and Chris Hipgrave finished 1-2-3 in the Carolina West Sports Medicine 2005 USA Wildwater Team Trials March 5-6 at Wesser, N.C. The two-day event on the Nantahala River, about 90 miles west of Asheville, determined who will represent the Unites States in the Pre-World Championships and World Cups in mid-to-late May in England, Ireland and Wales, the site of next year's biennial World Championships. McEwan, Calhoun and Hipgrave earned spots on the men's K-1 (kayak) team along with Rob Murphy of Decatuer, GA., Bern Collins of Colombus, N.C., and Lincoln Williams of Bryson City, N.C.
All of those paddlers -- except for McEwan, who was training in flatwater sprint kayaking before coming up short in a bid to make the U.S. Olympic team -- competed in the 2004 USA Team Trials last April on the Gauley River near Richwood, with Calhoun winning and Hipgrave placing second. MeEwan, formerly of Germantown, Md., and now living and training in Auburn, Calif,, won the 9-mile Animal Upper Gauley Race for the seventh time in eight years last September. Calhoun, of Bethesda, Md., was second and Hipgrave, of Bryson City, NC, third. McEwan, a distance specialist, did it again on the Nantahala. In the March 6 classic race, he blazed the 5.4-mile course in 24:43.9, passing six boats that started ahead of him in one-minute intervals. That allowed him to overcome a deficit of more than 4 seconds to Calhoun, who won both 2,000-foot spring races on March 5 before turning in a time of 26:13.8 in the classic race. Hipgrave, third after the sprint races, stayed in that position after posting a 26:32.9 in the classic. Between them, McEwan (2000, 2001 and 2003), Hipgrave (2002) and Calhoun (2004) have won the last five wildwater national championships in K-1. Hipgrave also served as race director and said he "put in several hundred hours" planning and organizing the event. And he was pleased with the results. "I thought it was awesome, the biggest turnout for the Team Trials since 1988," he said of the field of more than 50 paddlers from four countries. "I thougth it went really well." Hipgrave is a close friend of Donnie Hudspeth of Hico, who has brought a number of national and international events to southern West Virginia -- including last year's Team Trials, the 2002 Wildwater National Championships and the 2001 World Rafting Championships -- and is the founder and director of the Animal Upper Gauley Race. "People like Donnie, who runs a first-class event, I learn information from them, tweak it to fit what I want to do," he said. "It's a never-ending learning experience. And I've learned a lot from Donnie, particularly with the Gauley Race. I've learned a lot by attending so many." Hipgrace, Calhoun and McEwan all said they plan to compete in this year's Animal Upper Gauley Race, set for Sept. 26. The men's K-1 field in North Carolina also included Rodney Rice, a Morgantown native now living in Tennessee. 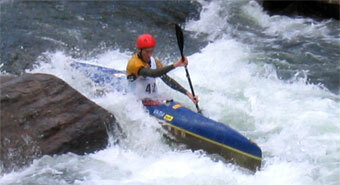 A realtive newcomer to wildwater kayak racing, he finished 14th. He is the son of Lori Rice, a secretary int he West Virginia University football office. in C-1 (decked canoe), Tom Weir of Snohomish, Wash., and John Pinyerd of Marietta, Ga., who finished 1-2 in last year's Team Trials on the Gauley, did so once again on the Nantahala. They will be joined at the World Cup competition by Mike Beck, formerly of Sebastian, Fla., and now living and training in Europe. Beck also participated in last year's Team Trials. In women's K-1, last year's Team Trials winner, Chara Whittemore of Freindsville, Md., finished second behind Jamie Tidmore of Bryson City, NC. The U.S. will not have a women's team at the World Cup because none of the qualifiers are able to make the trip. The big story among the women was the performance of K-1 Junior Emily Stein of Lookout Mountain, Tenn. She competed on the Gauley last April and had the best combined times among all the women on the Nantahala. She and Erin Wilder of Rockford, Ala., will join Eric Orenstein of Bethesda, Chandler Jones of Franklin, N.C., and Joel Abrahams of Auburn, Ala., at the Junior Wold Championships in Italy in July. The remainder fo the U.S. junior team will be determined in June in Colorado.